Captain Don Chittick has a BA in Biology and worked for many years at Sea World on Long Key in the city of Layton on Long Key. Captain Don also maintained the 11,000 gal saltwater aquarium at the Worldwide Sportsman in Islamorada for 20 years until he finally gave it up in 2017. 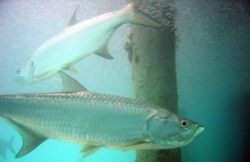 Stop in and see live Tarpon, huge bonefish and many other local native sport fish that you can catch in the Florida Keys.